How often do we look up to the skies? More and more we stretch our necks downwards to look at our phones and fail to take in what’s at eye level. But even rarer is for us to look skywards. These five wonderful non-fiction titles, and one picturebook for children, explore the world above our heads – both in the day, and at night-time. A follow up title to the hugely popular The Street Beneath My Feet, this is a book that unfolds concertina style to explore the expanse of space above our heads. Very beautifully, the two sides follow different paths: one is countryside/rural-based in that a girl is seen lying on her back staring up through the trees, and looking at migrating birds, spiders ballooning, cloud formations and up to the Solar System past the Northern Lights. On the converse side, which is technologically-based, the girl is seen staring up past skyscrapers, to helicopters, aeroplanes, weather balloons and space rockets into the Solar System. With measurements given along the chart, and information about the atmosphere, history and physics, this is a fascinating guide to the skies above us, and all that they contain. The book folds out to a whopping 2.5 metres tall – I cannot hold it up fully when standing, but laid out along a school corridor or a living room, this is a wonderful way to explore non-fiction. Zommer’s illustrations lend themselves both to the factual element – his rocket is intricate and cleverly shadowed, but also to the whimsical, with a floating umbrella Mary Poppins style. A well-designed, intriguing collaboration – this is exactly how to fascinate children with the world around us. You can buy it here. A more traditional guide to astronomy and the night sky in this well-designed and attractive non-fiction book. Atkinson’s long experience of writing about space and astronomy is apparent in the way that he distils tricky ideas into simple sentences, exploring in a down-to-earth way how to star gaze. 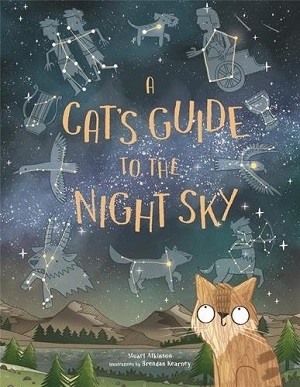 Beginning with keeping safe outdoors, the book (and its guide Felicity the Cat) takes the reader through the different seasons – the best time of year to view particular constellations and what the reader should be looking for, with explanation about the makeup of stars, the phases of the Moon, the Northern Lights and much more. Atkinson is matter-of-fact about what the constellations really look like, and how to try to view a planet, but Felicity the Cat adds nice philosophical touches, such as wondering if anyone is looking back at her too. The graphics are excellent, both the phases of the Moon and the constellations well-delineated, and there’s a feeling of immense friendliness and warmth in the domestic images of garden viewing platforms, as well as added humour with Felicity, who dresses according to the season. Includes a glossary and index. Age 7+ You can buy it here. 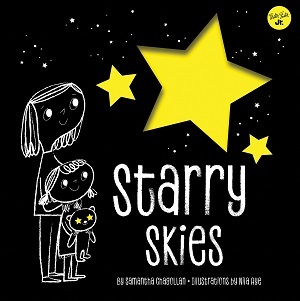 For younger children interested in the shapes and patterns made by the stars, this is an elegant and beautiful tactile little hardback with stiff board pages. A die-cut on the cover with an uncomplicated yellow star and a teddy bear with stars for eyes showcases the target age group and the simplicity of the graphics within. The author explains that the positions of the stars tell a story, and each double spread includes a constellation with an imaginative narrative sentence alongside: Ursa Major and minor are seen when ‘Sophia’ and her mom [sic] take a forest path, Pegasus is shown alongside ‘Leah’ on horseback ready to spread her wings and fly. The two-colour scheme of yellow and black works well to really illuminate the constellations, and the book is hardy and practical for taking outside. Age 4+ Stargaze here. Appealing on another level with a glow-in-the-dark fold out poster of the solar system (nicely attached and easily detached to the book with a perforated edge), is this straightforward but rather cartoonishly illustrated information book about the solar system. Each planet is afforded a double spread – with lovely illustrations of a young female astronaut and her dog peering at each planet. A glare is carefully shaded onto her mask, and she wears glasses near the sun – our courageous astronaut is seen landing on the Moon and optimistically Mars – other illustrations are even more supposed, such as when she views the asteroid belt sitting upon one of the orbiting rocks. But the text is fact-based – explaining definitions, measurements and scientists’ hypotheses. The colour palette is particularly alluring – Neptune is cast in almost phosphorescent blue, Saturn a golden glow, Mars a rusty brown-red. Captions and annotations help to explore the full-page images, and although short, this is a great introduction to the solar system for intrepid space explorers. Age 5+. You can buy it here. Planetarium is the latest in the Welcome to the Museum series, this time in conjunction with the Science Museum. Wormell’s last collaboration in this series was on Dinosaurium, whose lavishly illustrated creatures set a high bench mark for illustrated non-fiction. This tome, exploring the Solar System, is no less delightful or comprehensive, and maintains the sophisticated authoritative tone of the rest of the series. 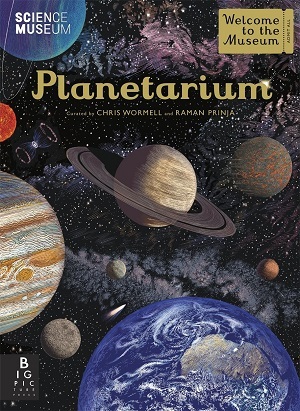 Written by Raman Prinja, a Professor of Astrophysics at UCL, the book aims to go further than many space information books for children, starting with an explanation of radiation and light and traversing through the history of astronomy before navigating the Solar System, star life cycles and black holes. The end of the book takes in the incomprehensibility of huge superclusters and Universe expansion. 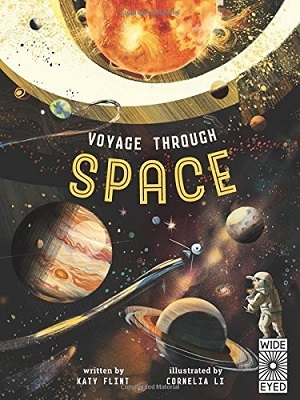 For space fans and astronomy maestros this is one outsized book they’ll yearn to devour. 8+ years and beyond. Explore the museum here. 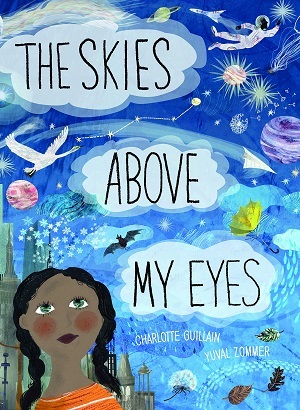 I’ve added a picture book to my ‘skies’ blogpost because often the information and facts we absorb on a topic lead us to daydream about our own or others’ adventures in that area. And because quite often, even though a children’s ‘knowledge’ topic at school may revolve around learning facts, they will often spark off into a piece of creative writing, and this picture book ticks all the boxes in providing educational content, inspiration, imagination and energy. 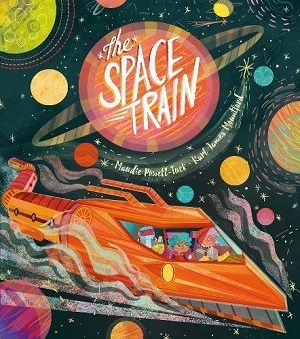 The Space Train is a wonderful lift-the-flap adventure about a boy and his grandma in the future and their attempts to rebuild the space train – a vehicle that propels through space faster than a rocket. Not only is this a fun and cheeky adventure, but it is richly illustrated with a bold colour palette and a super eye for detail. There are hidden flaps and holes to peek through, and a thrilling mind-whirling combination of ‘sciencey’ words, make-believe and the power of grit and determination, as well as a wonderful relationship between grandparent and child. When Jakob and Granny attempt to fix the old space train, they have to put together the thrusters and combustion chamber by riveting and welding. But there’s intergalactic imagination too – with a Toolbot, a robot chicken, an intergalactic buffet car, an observation deck and much much more. This is an imagined future universe of fun and adventure, but complete with a modern, energetic engineer Granny and brilliantly drawn full page illustrations of what it might be like to live in a future space station. Let your imagination soar here.